My little design became a reality. 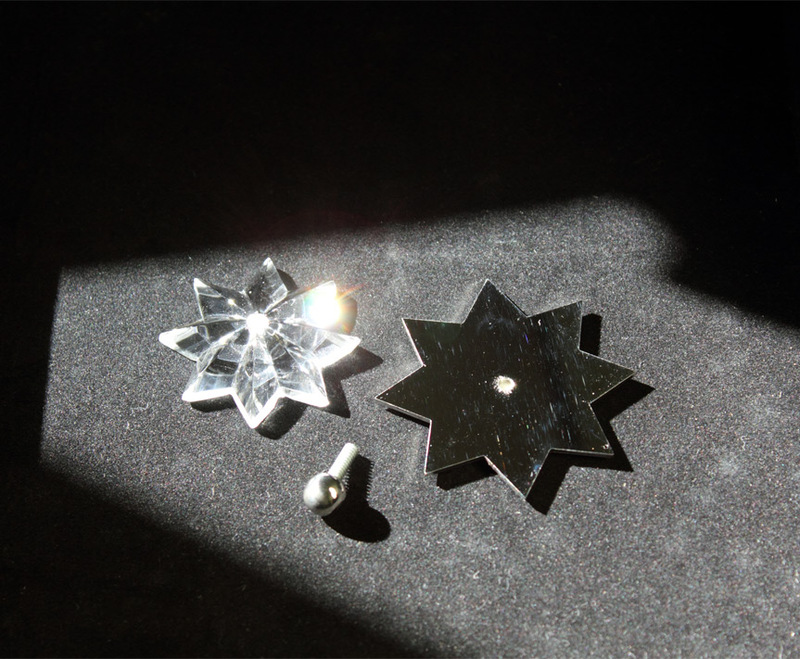 After purchasing the crystal stars online, I took them and my design drawing to a local jeweler hoping they could create the nickel plated components. At first they were confident about pulling it off, but after three weeks, they called saying it wasn’t possible. That’s when my designer, Charley McKenney, offered to take my design to the metal artist who had previously created metal backs for two of my antique sconces. This guy, with no fuss, was able to make my vision a reality. Not only was the price reasonable, but they were more beautiful than I had ever hoped for. The brass stars were cut into shape before they were nickel plated along with the balls that would eventually be soldered to the screw posts. My idea was to have all the components separate. That way I could thoroughly clean the parts and avoid dirt and dust from collecting, thus mucking up all the sparkle. And because I can be such a spaz when cleaning, I have extra crystal stars to replace the ones I might break in the future. My inspiration was from the book, David Adler, Architect: Elements of Style. In 1931, he had adapted an existing farmhouse to create an exquisite home for his mother, Mrs. Isaac D. Adler (1861–1939). On two sides of his mother’s bedroom, he had designed walls of mirrored paneled doors. 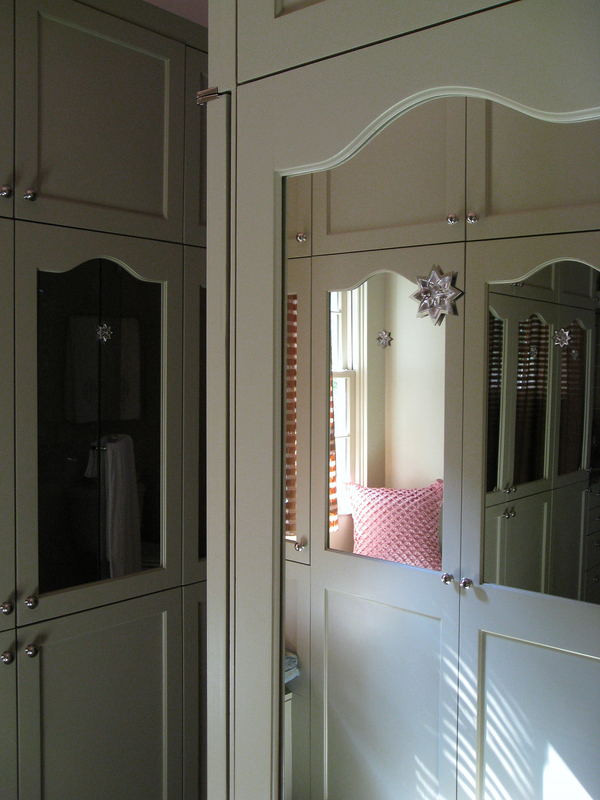 And if you look closely at the below scan from the book, you will see a crystal star on each mirrored door. I believe that in those days, these stars actually held the mirror in place on the solid wood backing of the doors. But in my own dressing room, the mirrors are inserted into the frame opening on the back side of the doors and are held in place by some sort of plastic stripping. And to protect the fragile backside of the mirrors, a very thin piece of painted plywood has been added. To the front of the mirrors, the stars have been affixed with a very strong double sided tape. Since they serve no practical purpose, they are purely decorative. Coincidentally, David Adler’s sister, Frances Elkins, has been a huge influence on my interior design choices throughout the restoration process of my house. Both brother and sister were at the peak of their careers when my little bungalow was being built in 1938. In future posts, I will show you how Frances helped me design my house. 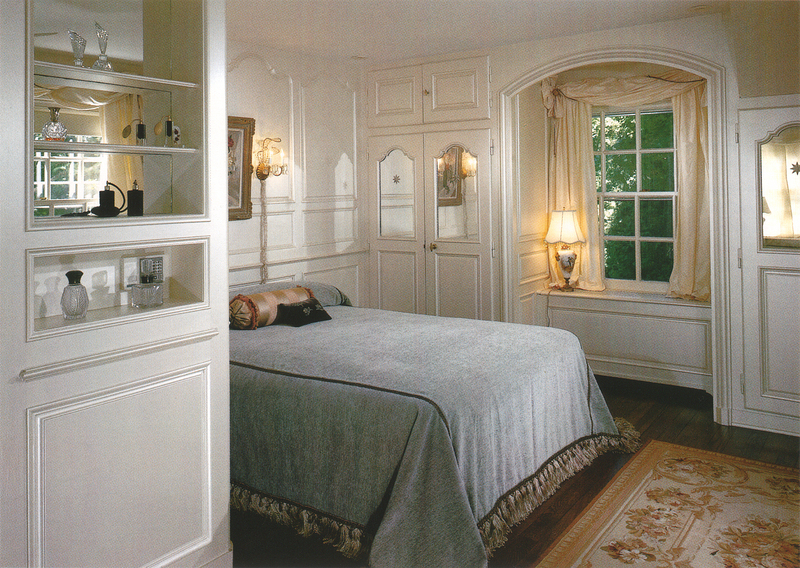 (above) Mrs. Adler’s bedroom, as designed by David Adler, was the inspiration for my dressing room’s mirrored paneled closet doors. Beautiful, PA! The stars are lovely.